At one point in the demo, Death walked up to what looked like a pile of rocks, stuck his hand in a hole, and caused the rocks to reconfigure themselves into a rock robot. Death then jumped on its shoulders and used it to get around, driving over some lava and then shooting one of its fists out so he could run along a chain, which connected its fist to its arm, so he could get to a previously unreachable area. In the demo, Death used the construct to get around. But it can also be used to combat your enemies. “You can actually shoot the first out and hit them with it,” Stefanelli says. 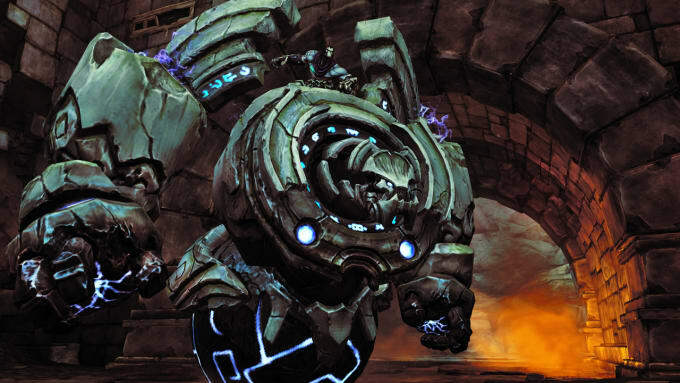 That he said it with another sly grin, though, makes us think there may be still more to learn about Darksiders II.